Superb quiet apartment with air conditioning, refurbished, free wifi, with pool view, small sea view and close to the beach of Fanabe. Have a nice stay in this renovated apartment with a large sun terrace. Rooms with dressing room of which one giving on terrace, nice bathroom, satellite TV. Highly recommend this apartment. It is exactly as you see in the photos. Steve was an excellent host and constantly available for any queries. Great location close to beaches etc. We will definitely return. Thanks Steve !! Очень хорошие апартаменты. Есть все необходимое и даже больше. Стиральная машина, посудомоечная машина, мини-сейф, утюг и гладильная доска, шикарная духовка, совмещенная с микроволновкой, большой холодильник, телевизор. А также приятные мелочи: Бокалы и стаканы в большом количестве. Вешалки для одежды - в большом количестве. Тарелки разных объемов - в большом количестве. Сковородки, кастрюли, салатники, хорошие столовые приборы и т.д. В апартаментах есть великолепная терраса с видом на горы. Совсем рядом расположен огромный супермаркет Mercadona. До отличных пляжей прогулочным шагом максимум 10 минут. На территории апартаментов 4 шикарных бассейна. Хозяин апартаментов - Стив, веселый и приятный человек. Стив пользуется голосовым переводчиком на телефоне, так что языковых проблем при заселении и выезде вообще не почувствовали. Нам очень понравился отдых в апартаментах у Стива. Спасибо. 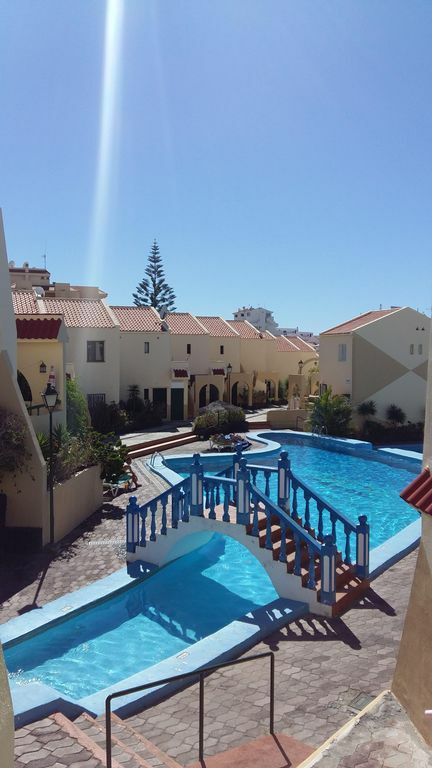 The apartment at Mare Verde Resort is in a good location, just a short walk to the beach. Small local supermarket close by. Steve is a good host and very helpful. Steve was great host. Arranged baby cot for us and when we found hair dryer was broken - he bought a new one straight away. Apartment has all needed amenities, pools around estate were lovely. A few minutes walk to big supermarket Mercadona for bigger shopping. We loved it. A lovey spacious modern apartment, sunny terrace, Walk in shower, plenty of clothes hangers air conditioning ,ceiling fans in rooms, light and airy throughout. Steve and his wife were lovely , Steve was even able to pick up and drop us off at the airport. He was very informative and gave us clear instructions on everything we needed to know. They recommended a lovely Indian restaurant and we weren’t disappointed . The Mare Verde resort is well kept with lots of small swimming pools that were never too busy (not whilst we were there ) there was also a large swimming pool. Our apartment was in an ideal part of the complex ,close to everything. We traveled with my adult autistic daughter which can be a challenge, but with the description of the apartment and by asking Steve a few questions it made things much easier. We have used home away many times and will be using them again. On a final note we would highly recommend this apartment and would happily visit again, and once again to Thank Steve and his wife for playing a big part in making our break a more relaxed and enjoyable one. hoping you do not get too cold at home. Thank you for your comment this is very fun and warm in the heart. you have been very pleasant and especially very grateful customers to us. hoping to see you again it will be a great pleasure to welcome you again. And thanks again for your gifts we will think of you.